Arctic Monkeys may have been pegged as a lad rock band when they first exploded back in 2005, but we now know that there's more to songwriter Alex Turner than first met the eye. 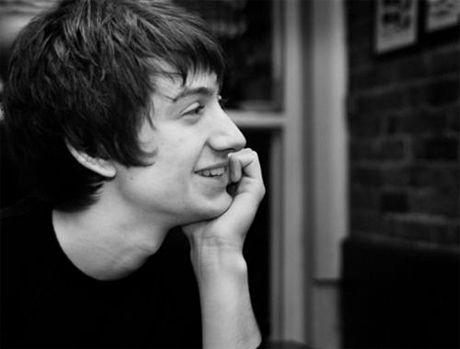 In 2008, he unveiled side-project the Last Shadow Puppets, which explored lush, orchestral pop. Now, Turner has announced he will be working on a score for the upcoming film Submarine. According to IMDB, the film is "a comedy which follows a 15-year-old boy with two objectives: To lose his virginity before his next birthday, and to stop his mother from leaving his father for her dance teacher." It is based on a novel by Joe Dunthorne and is directed by Richard Ayoade. NME points out that Ayoade previously directed Arctic Monkeys' concert DVD, At the Apollo. Contact Music reports that Turner's score will be released as an album, which will be his first solo release. It was produced by Simian Mobile Disco's James Ford, who has previously worked with both Arctic Monkeys and the Last Shadow Puppets. There's no word on what the new recordings sound like, but the cinematic strings of the Last Shadow Puppets are probably a good starting point. The movie is currently in post-production.